Internet has become so all-encompassing; you would be forgiven to think it has been there from the beginning. From San Francisco to Singapore, and from Minnesota to Moscow, the digital world has become accessible to well-nigh anyone with a mouse to click and a pocket to purchase. No matter which and what kind of businesses you cater to, it can be safely assumed that the online territory has already wormed its way there. The digital is no longer just a buzzword. Online is getting mainstream and there is no way out of this digital bandwagon if a business doesn’t want to be left behind. The expectations of online customers are at all-time high and impressing consumers in the digital realm is not an easy task. Why You Need Internet Marketing? Digital Marketing is a convenient and effective marketing strategy because of its low costs, and extensive reach. With correct Internet know-how, a business can utilize the online landscape to its maximum. Marketing is a challenging field and if done correctly can do wonders for a business but it has its flip side too. Done wrongly and it can put off your consumers off your website and even your brand. Therein lays the requirement of an expert to help you penetrate into the homes of your target customers. To make your marketing efforts a success, you need specialists who know the fundamentals of online Marketing Services. We at Carmatec, strive to build lasting relationships with our clients by providing a one stop-shop model incorporating cohesive Internet marketing solutions for organizations of all sizes. Why Should You Hire Us as Your Internet Marketing Partner? We spend time in understanding your business and customer needs. Since we don’t believe in a ‘one-size-fits-all’ concept, we take efforts to make your website and marketing efforts unique. Your insight coupled with our expertise and solid experience help create high-end web solutions and impactful marketing campaigns. With over 15 years of specialized domain exposure, we have a comprehensive understanding of web development and optimization. We have a team of highly experienced professionals specialized in providing sophisticated web solutions. We have a talented pool of experts in SEO, PPC, Social Media, Web Designing, Web Development and UX. Our UX experts and web designers work closely together with SEO specialists to provide SEO friendly websites. What set us apart from the herd are our cutting-edge designs, in-house technology, pioneering internet marketing strategies and on-time delivery. Since, our solutions are client-centric; we let our numerous testimonials speak for us. We are a one stop shop for all your web-based marketing needs like SEO, SEM, SMM, web conversion and analytics and mobile website SEO. Running a business is tough enough and adding the woes of handling multiple contacts and invoices coupled with managing different service providers, is imprudent. We offer a fully managed solution with wide variety of services and custom suites all under one roof to ensure all components of our marketing efforts work together to deliver tremendous results. We have clients from all over the world from various strata of businesses. In our 15 years, we have grown from a small outsourcing firm to a successful company sustaining clients worldwide. Our customers are our biggest assets and we consider them as partners in our mutual success. Since we strive to provide the best services there is, our customers not only recommend us to others, they do keep returning to us with new projects. We have a dedicated support team for our clients. We have no-restriction policy when it comes to our customers. Unlike other Service providers you can directly communicate with our in-house experts. With ‘real’ internet marketing experts helping you every step of the way, doing business with us has real advantages. Our SEO Experts at Carmatec follow the search engine algorithms closely in order to promote the websites successfully. This has been one of the strongest reasons why we are so successful with search engine optimization. The online world is fickle and ever changing. Our SEO experts stay on top of the game with right skills and updated expertise to help boost your visibility and ranking. 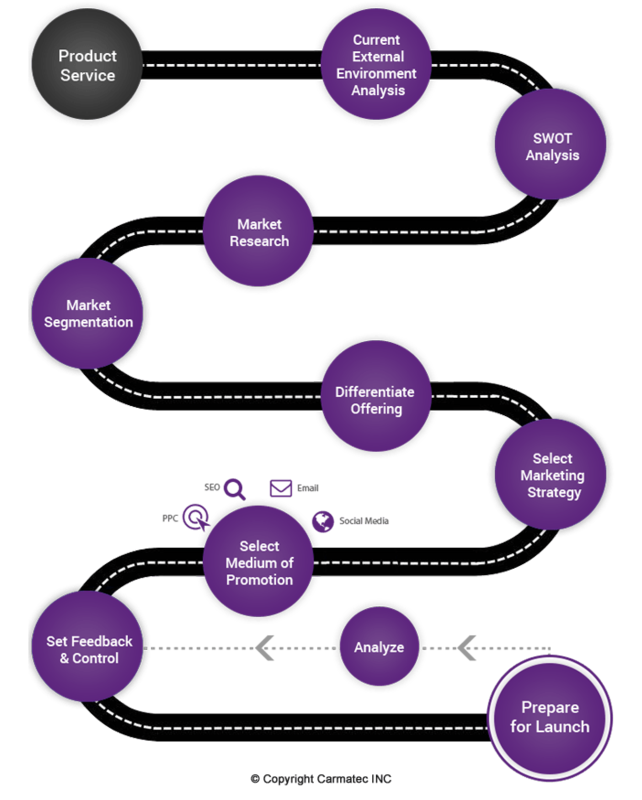 We at Carmatec have PPC strategists to help you generate more business at low investment. Our SEM Specialists are certified in Google Adwords, Bing and Facebook. With our focus on strategies designed to improve your returns, we use enterprise-level tools together with years of experience to bring out the best SEM experience your money can buy. The world is going social, so should your business! Our experts at Carmatec will help you set up the right social media campaigns with correct social channels and help you reach your target audience faster. Our social media experts will not only help you get the most out of your social networks but will help you rise above your competition. Our social media whizzes not only know the nitty-gritty of most important social portals but will also help you create a personalized and unique social media strategy with campaigns, promotions, setting up communities and other services. For most internet marketing service providers, marketing efforts translate to driving traffic to websites and that’s all. But at Carmatec, we realize the importance of converting visitors into customers. Simply put, we understand that it’s all about profits for businesses and therefore we are focused on conversion rate optimization. With our top-of-the-class strategies, we will help you get more user engagement and leads. Go mobile! Unquestionably, mobile devices have become a staple in our daily life. More and more people are accessing internet through those small hand-held devices and there is no better time for a business to tap in the untapped market of mobile internet. At Carmatec we know that the mobile age is upon us. That is the reason why we optimize the websites compatible with all the mobile devices. Our experts not only ensure mobile-friendly websites but also ensure up-to-date speed. Choose us and get an edge over your competitors by going mobile.